I have a question regarding viewing images on different devices, I used a calibrated 24in Asus monitor and LR5.7 to process my images, I would consider myself fairly conservative with the colour sliders in general, but I’m finding that my images never look correct in terms of colour saturation when viewing on mobile devices, i.e. iphone/ipad/Nexus tablet. Images viewed on these have less colour when compared directly with my monitor. I have compared my monitor against my ipad when viewing images on 500px, and it doesn’t look too bad – perhaps 500px optimise their mobile app? Any ideas, is it simply a case of the mobile devices not being able to display as wide a colour range? I’m generally happy with what I’m seeing from my monitor. Firstly, your desktop display can most certainly output a much wider gamut of colours than most mobile devices. But that’s not likely the issue. 1. Your photos will never look exactly the same on every device or in every viewing scenario. So forget about that. However, you didn’t mention what system you’re using to profile your display. I only recommend the X-Rite solutions. For most people the i1 Display range is ideal; for people on a budget or making their own prints the ColorMunki is very good too. 3. When your images are destined to be viewed on any type of display, you always need to embed the appropriate profile for on-screen viewing. This is always sRGB. Using any other colour profile will produce highly variable results. So when you export from Lightroom, make sure you’re specifying the sRGB colour space. If any of the above conditions are not met, your viewing results will be highly variable at best. And even if you’ve done all the above, the most you can hope for is to find a comfortable compromise. This means getting your images to look the way you want in your colour managed environment, and then view them on several other systems to see how they look. In many cases your images will look darker or lighter, and more (or less) contrasty and saturated when you view them on different devices. And even in different browsers or apps. This is due to the fact that the systems and software are rendering the colour values differently. And yes, 500px is most certainly processing the photos internally when they’re uploaded, to try and make everyone’s photos more vibrant and punchy. However, if what you’re seeing is that photos on your own display look one way and on several other systems they look different than yon your display but similar to each other, it’s most likely because your primary display is not showing you an accurate preview. Or you’re using the wrong profiles. Or both. In my experience, my desktop display looks less contrasty and less saturated than when I view my pictures on non-colour managed systems. If yours is more saturated, there’s likely something amiss with your colour management procedures. Let me know what display calibration package you’re using, and try making a better profile. Locking down your colour management can take time and there are many fiddly little bits that can throw the whole thing off. I’ve written a lot about colour management over the years, and there are many more articles on the subject here on Photography Essentials. Hope this points you in the right direction; let me know how you get on. And thanks for your contribution! For photographers, working with a properly calibrated and profiled display is by far the most important factor in maintaining accurate color. You need to be able to trust what you see on the screen! 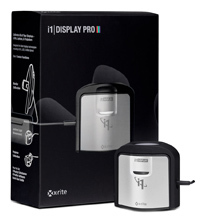 X-Rite has been announcing many new and updated products over the past several months. Of particular interest to photographers are the brand new ColorMunki Display and i1Display Pro, both of which are getting rave reviews. More exciting is the fact that X-Rite is offering rebates when you trade in your old profiling solution. Details on the trade-in program are here. I’m trading in my trusty old i1Display 2 for the i1Display Pro. If you’re a photographer, I strongly recommend you consider the excellent new monitor profiling solutions from X-Rite as well. Using color management is a critical element of getting your digital photos from capture through print. If you want your prints to look their best you should establish and follow a color-managed workflow. Color management refers to a system of computer hardware and software working together to translate color from one device to another in a controlled way.